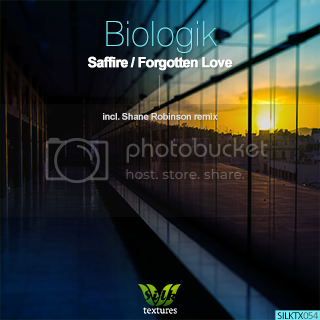 It is a special honor to feature Canadian sensation Biologik on Silk Textures once again. His innovative compositions are always rich in depth and atmosphere, often possessing an overpowering cinematic quality. Not surprisingly, Beatport recently highlighted his second artist album "Two" [Stellar Fountain] as one of the best albums of 2013. His latest contribution, "Saffire", features a cavernous bassline and pad-centered soundscape. The groove picks up steam as it approaches the main break, where gorgeous crystalline synths begin to seep into the mix. The effects become more prominent as the low-end energy continues to crescendo. Biologik succeeds in vividly depicting a utopian subterranean world. The second original contributed in the EP, "Forgotten Love", is an equally evocative, late-night progressive gem, with a darker edge. Various melodic layers, as well as a repeating vocal sample, paint a vivid and, at times, haunting soundscape. Shane Robinson, who can always be counted on for an elegant deep-progressive take, offers a brilliant interpretation of "Saffire" to close out the EP. A resonant bassline groove sets the track in firm ground early on, as various atmospheric effects once again evoke a world inhabited by stalagmites and stalactites. The lead synth and pad progressions, intricately woven into the soundscape, leave an enduring imprint on the listener long after the song's conclusion.